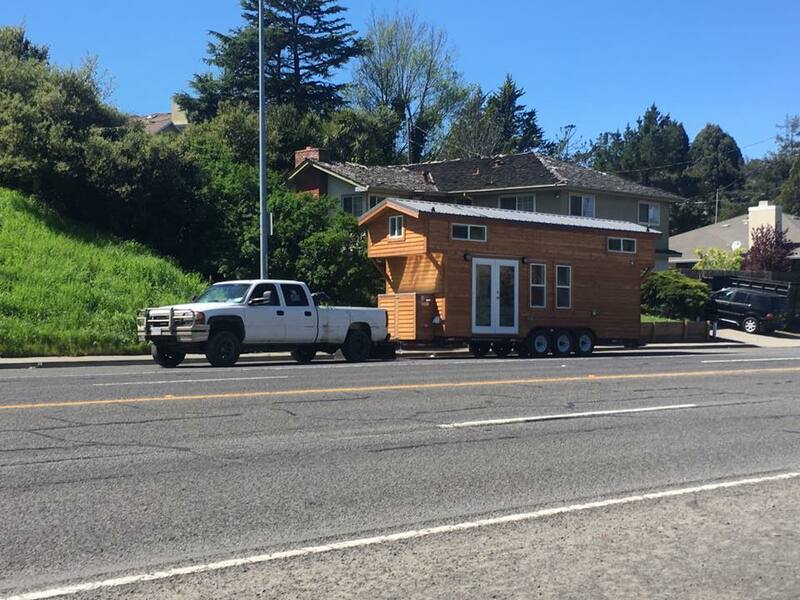 Tiny Home for a Tiny Lady ! 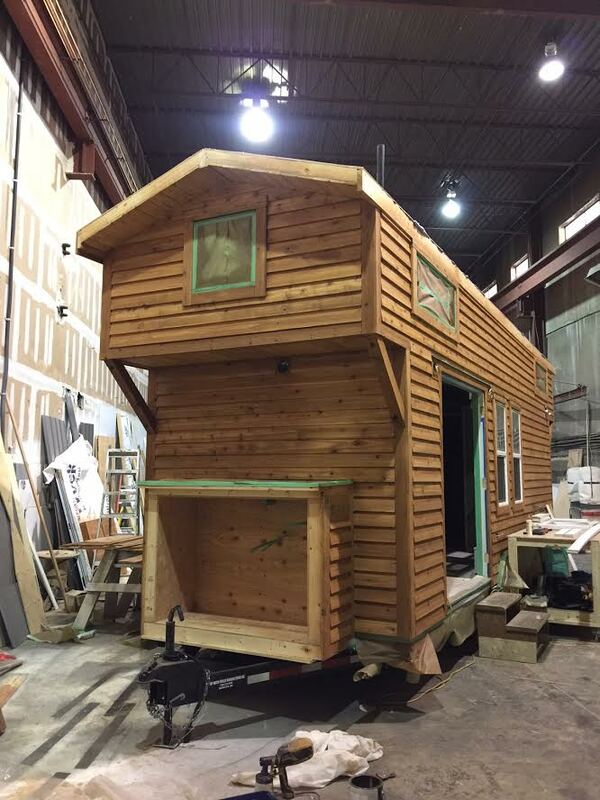 I started the concept for my Tiny Home in the spring of 2016. I was living in San Diego at the time and paying an exuberant amount of rent as you can very well imagine. I knew I wanted my own space, but my wish list seemed impossible and the housing market in San Diego is insanely expensive. My Wish list for a home looked a little something like this; Live on my own, have my own unique space, Build creatively not buy (not even a possibility for me financially for a regular sized home in California), Create a home - a home where I am not renting but I own and can make my own, Full Washer and Dryer, Gas Stove, No dishwasher or microwave – dislike them entirely, Enough room for Floyd (my bengal), A room that can fit a Queen sized bed, A decently sized Closet, A Shower / tub, Solar Panels, and all environmentally friendly / sustainable. So I searched and searched for more apartments, the same old expensive spaces without creative thought or detail KEPT coming up. I knew about Tiny homes, I have seen all of the HGTV shows and home improvement channels and I didn’t know if it would be possible for me. So I started my research and got more and more enraptured with the thought of this minimalist and creative sustainable lifestyle. It was everything I had ever wanted, AND MORE! 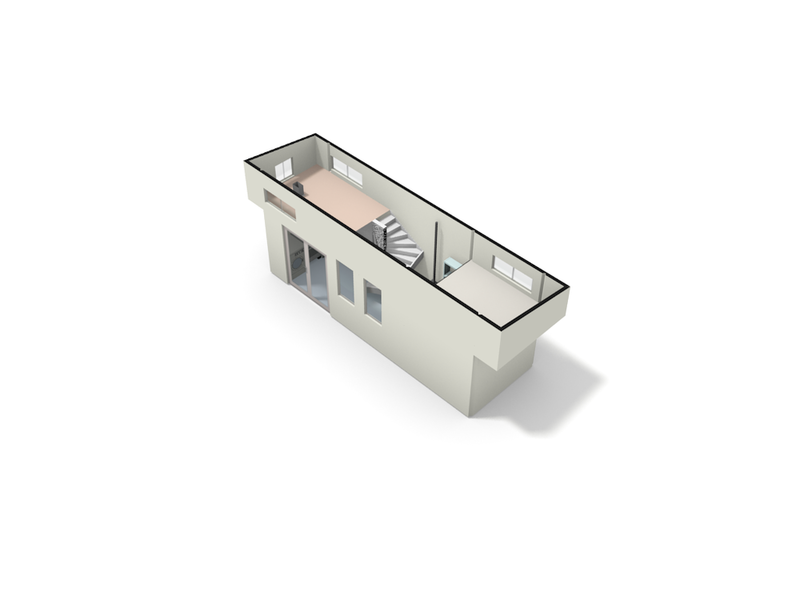 They, like some other companies, had some standard house models on their website, but I wanted something my own. I decided I would design my own tiny home and see if they could make it come to life, lucky for me, they agreed! Now to those of you who are not ready to spend extra money for custom designs and layouts, this route would not be for you, but it was my personal desire to have a space that I designed on my own, and to spend the extra money to make it this way. 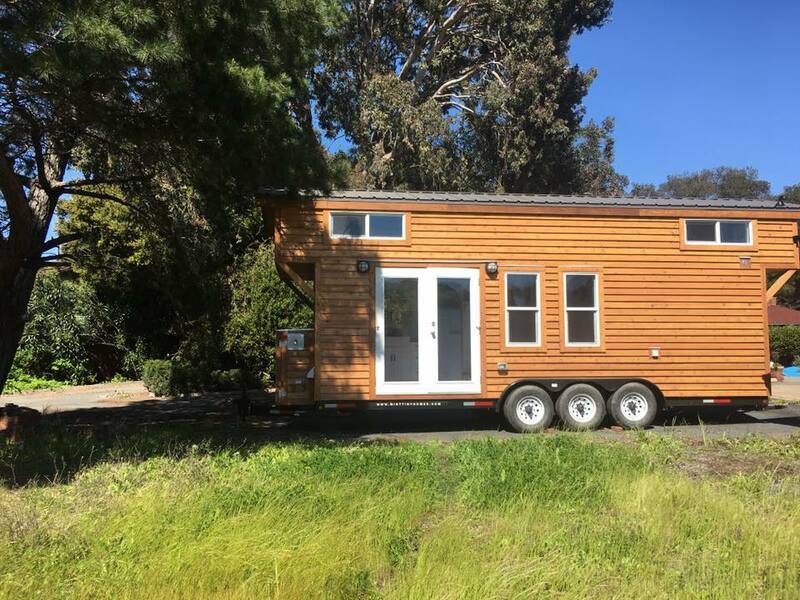 If you are looking for an affordable tiny home solution, some folks build them on their own and some folks just stick to standard designs and add to them later. I joined Pinterest for the first time, created a board of all the things I desired, and started thinking of what I absolutely needed to fill the approximate 28-foot-long and 10-foot-wide structure. It was hard at first but I found some designs online and started to add my flavor to them. i also found a young couple on instagram who had used my same builder, i connected with them and they absolutely love their home. it was great to get a confirmation of post-build results and references. Tiny Homes living won my bid! The below pictures are what I came up with in the early stages of my discussions with the builders in August 2016; note I am not a professional designer or architect so please excuse the INACCURACIES in these drawings. I was very excited to get some renderings of my own on paper and would love to share my ideas with you all! These were the very first renderings of the home and after a ton of back and forth with Tiny Homes Living on designs / what could and could not be done, I ended up drawing out these images below. ( a tad more artistic design of what I wanted the home to look like). The Exterior as of January 2017, looking very nice, windows still being finished this month and working on the interior in February! The Bedroom Windows look awesome, I cannot wait for the finished product here, the outside of the house is really coming along. The House is set on a frame that can hold upwards of 18,000 pounds! It is sturdy and ready to go on the road once we are finished with the build. We will be moving this home from Vancouver to San Francisco! Interior of the home is coming along amazingly! This is my future living room! The french doors open up to the living room and you can see the second loft in the corner, there will be custom floor to ceiling bookshelves on the right side, a barn door leading to enter the bathroom, and the guest loft will become part closet (for extra clothing space), and part reading nook / guest bedroom! Here you get a better view of the Guest Space and doorway to the bathroom. The Bathroom will have a sink, full shower, compost toilet, and walk-in closet. The doorway will be framed by two custom-built bookshelves (I LOVE TO READ)! The right hand side bookshelf will be floor to ceiling and the left side bookshelf will come to the floor or the loft. 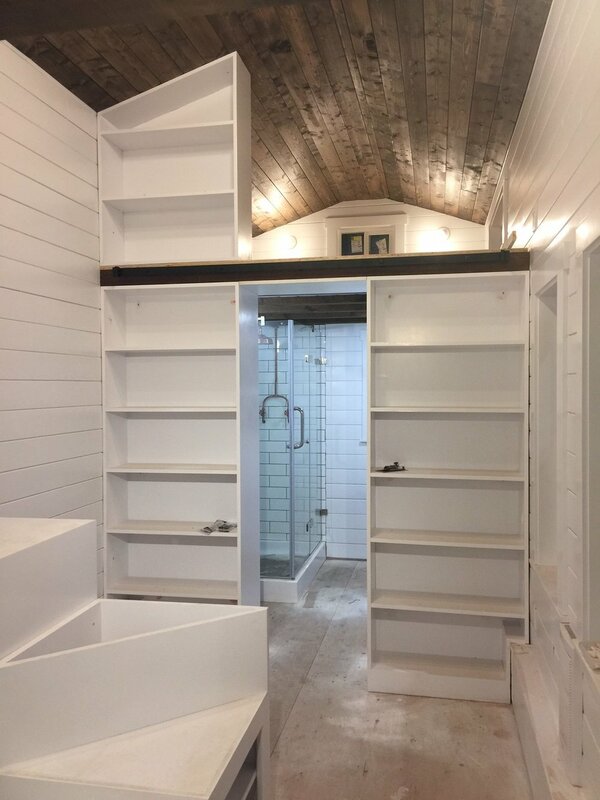 The door to the bathroom will be a barn door walking into the sink are and walk-in closet space (you can see the second wall in the bathroom separating the closet from the compost toilet. This is the view of the kitchen at the front of the house as well as my Bedroom :). The kitchen will have a stacked Washer/Dryer in the corner, a full 4-burner propane stove, a lovely farm Sink, and A SMEG Fridge. 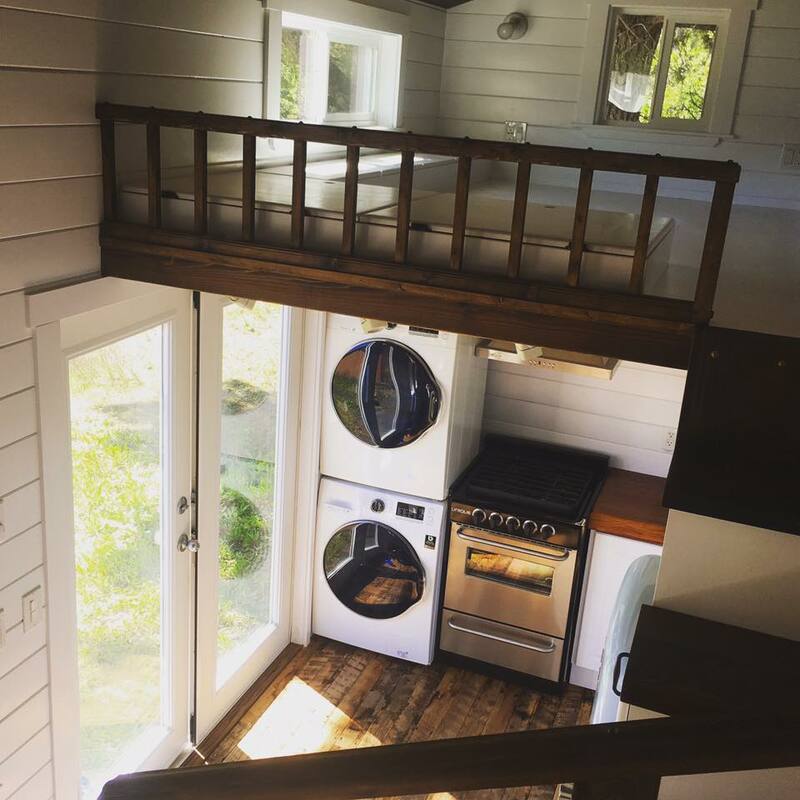 The Staircase was designed by Tiny living homes, they are amazing! The staircase will wrap around and up to the loft creating a unique and modern feel in a rustic home. The bedroom will be my nook and sanctuary! The house build is moving right along! I am so excited to share these new pictures with you all. 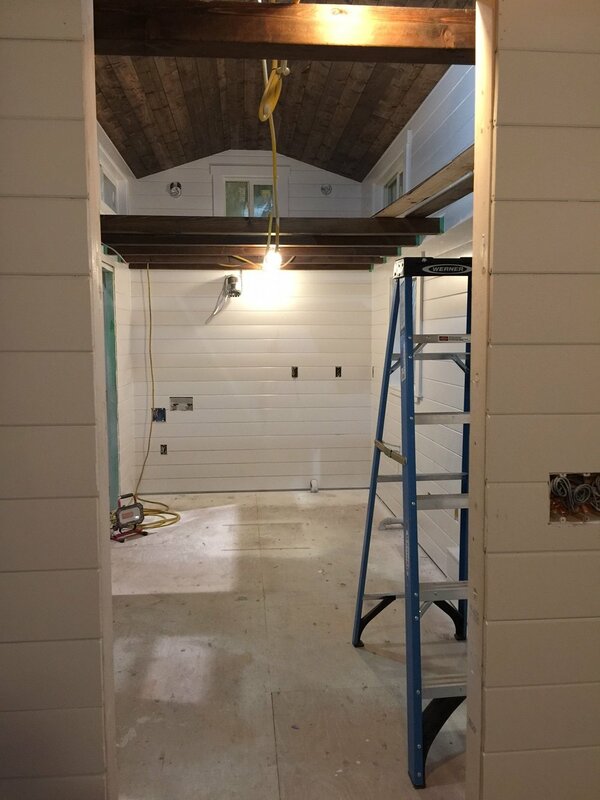 The interior is painted white and the beams and ceiling stain is finished and installed. I went with a clean and classic concept, white walls and dark stained wood finish for the ceiling and beams. The floors are being milled now and should be the next to install. 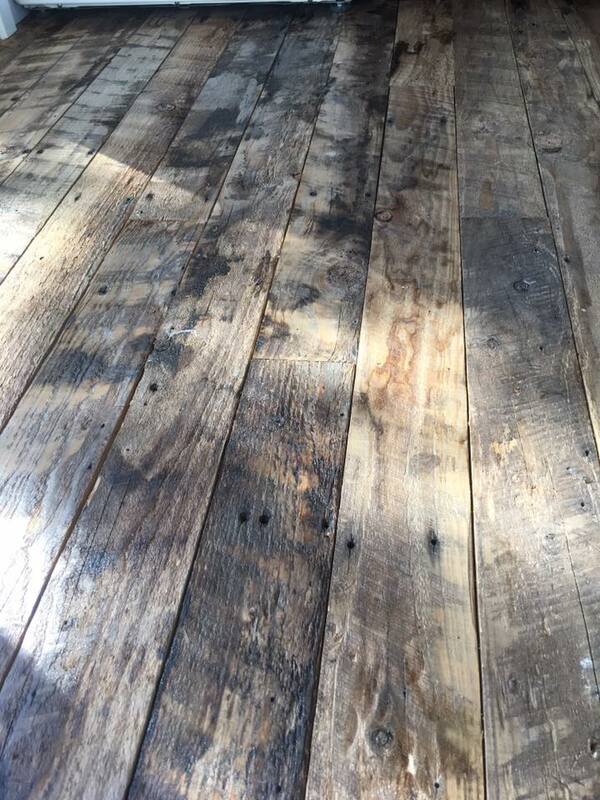 I custom-designed my floors, they are made from reclaimed wood of all shapes and sizes and I think you will really enjoy the outcome. I am planning to use different stains on each panel so it will be creative, one-of-a-kind, and amazingly aesthetic! After the floors are installed, the appliances will come next! I have an SMEG fridge on its way to the build site as we speak and it is absolutely gorgeous! The old-school vibes mesh so well with the classic white and dark brown. I am getting more and more pumped every day! And what you all have been waiting for is updated pictures... scroll down below for more! I finalized the flooring concept out of reclaimed Douglas fir in a colonial style with different patinas on each board. I also finalized the concept for the counter tops. I went with a custom redwood slab for both the kitchen counter tops as well as the counter top in the bathroom. The smeg fridge has arrived safe and sound! This retro style is something i truly treasure for the home and this fridge will certainly be a pop of color as well as fun talking piece for the home. check out smeg appliances online, they make everything not only fridge's and they have some amazing products! Things are moving right along here at the end of February! We have the floor to ceiling bookshelf installed and the half bookshelf installed as well. you can see through to the bathroom where the shower is being finished and tile is setting! Things are rocking and rolling in this tiny! Here you can see the entire kitchen space and how open it is! The appliances will be added last after the floors go in, but you can see the stove hood was just installed! This image also gives a great view of the staircase that wraps around up to the Bedroom loft! check out the storage in the stairs, each staircase will open up for added storage inside :) So Sneaky! 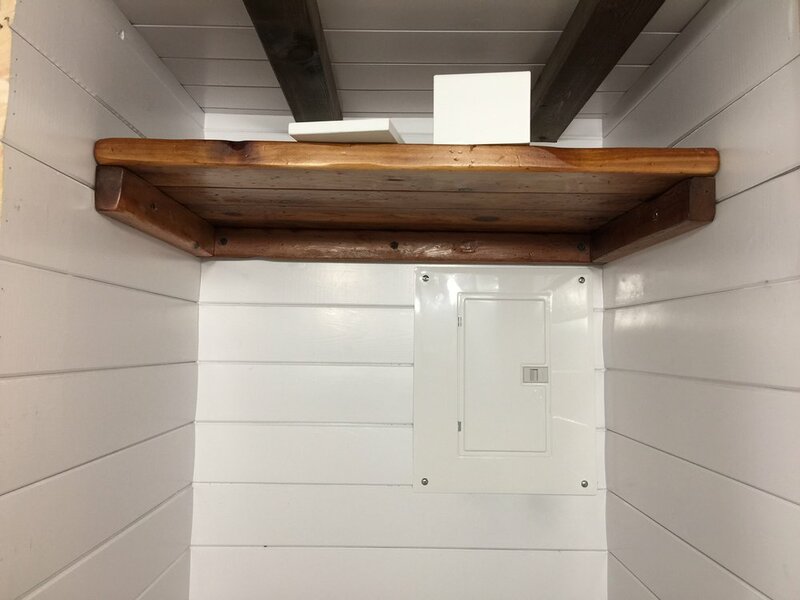 The loft storage was also just installed, you can see the white loft storage bins above! Amazing extra storage space for the bedroom! tiny Storage wherever you can get it! Here is an awesome image of the staircase! the empty space is for the smeg fridge, she will slide right in there after the floors are installed. 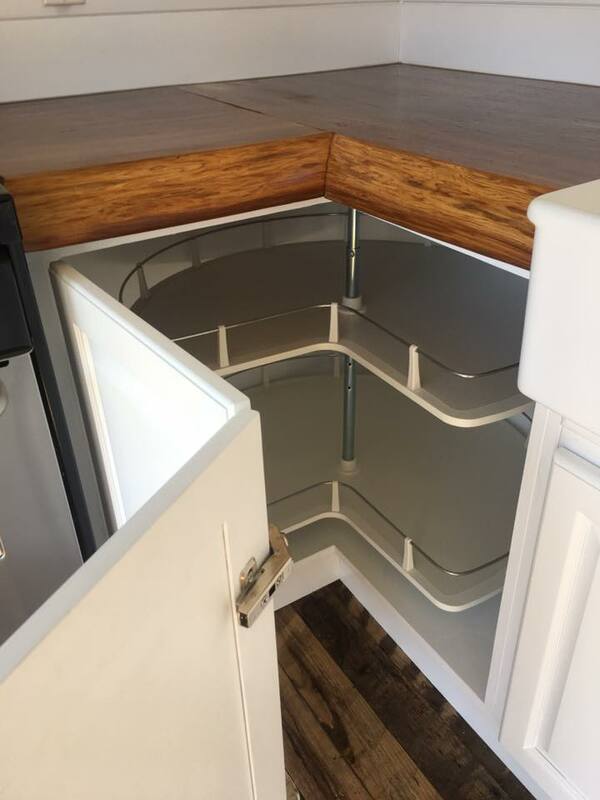 as you can see, there will be room above the fridge for storage. next to the fridge/under the stairs is a pantry closet, this will be for food storage. This image gives a great view of the stair case, you can see the side storage on that second step, all the other steps have storage down inside. Great view of the custom designed (by me) bookcase in the background. I am an avid reader and cannot wait to fill up my library! i really wanted a specific look, i researched tons of copper and wanted to keep everything simple and industrial. 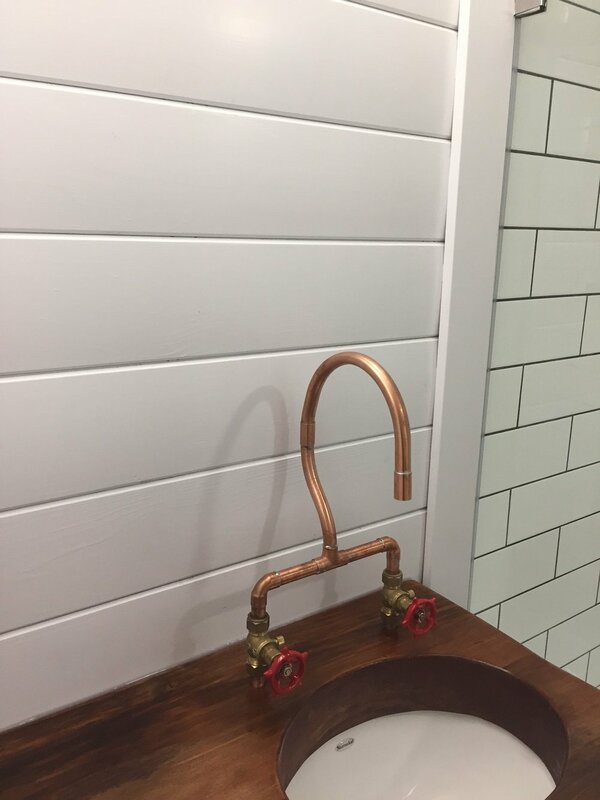 this copper install for the SHOWER HEAD is one-of-a-kind and the same goes for the sink hardware which will match. this bathroom is turning out beautiful. in my opinion its about every single detail. thank you Tiny Homes Living for being patient with all of my special requests, you guys rock! custom redwood for the bathroom sink counter was just INSTALLED! there will be copper piping for the sink to match the shower hardware and a drop down sink below to keep the surface smooth and sleek! This piece of wood is gorgeous! The build stages continue into final versions of the home! Enjoy these fun photo-shoot and staged photos from the Tiny Home Company that were professionally taken for their website :) So flattered that they loved my ideas and worked with me throughout all changes and challenges! A direct quote from the builder below. The Bathroom is Finalized, check it out!!!! Compost toilet is installed and ready!!!! Sustainable living HERE I COME!!! Extremely excited that my new home will be helping to improve the environment, something I am super passionate about! My Image of Bookshelves Floor-to-Ceiling came to LIFE! I am so thrilled to fill these shelves with my favorite novels. This photo is staged for a photo shoot but as you can see, the Barn Door has gone in which will lead into the bathroom area but gives a nice cut-off when the bathroom is not in use. There is a Wood Stove in the corner of the Living Room and I cannot wait to add a cozy chair of my own for reading and relaxing! Here is a nice view down from the stairs to the living room area and entrance into the bathroom and walk-in closet. The photo to the right shows the living room and barn door opening up to view the bathroom area/shower can be seen in the back corner. The photo on the left shows you an amazing Image of the Loft Living Area, I cannot wait to make this into an upstairs living space / guest room! This photo was staged for the photo shoot. Living Room Heat coming in HOT with this amazing Mini Wood Stove. Sustainable and energy efficient :). Another View of the Upstairs Loft area! So pumped for this space! Here is the final space without all the bells and whistles from the Photo Shoot! I am ready to make this Loft area my own! This bedding is staged for the photo shoot but I am so pumped with how this space feels so comfy and all that bedroom storage is amazing!!! Here is the bedroom all finished and painted white all the way to the flooring. The paint is drying in this picture but it is almost ready! 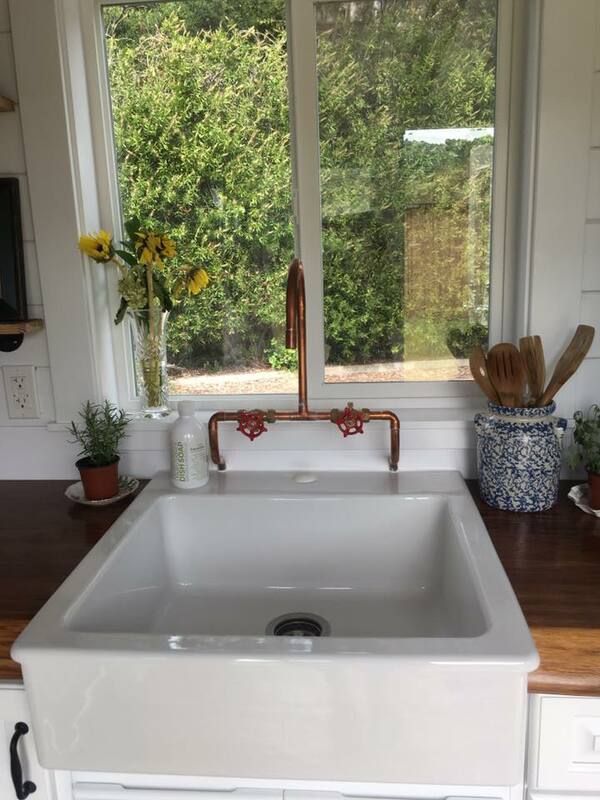 Kitchen Sink and custom copper faucet! The SMEG makes this entire kitchen POP! 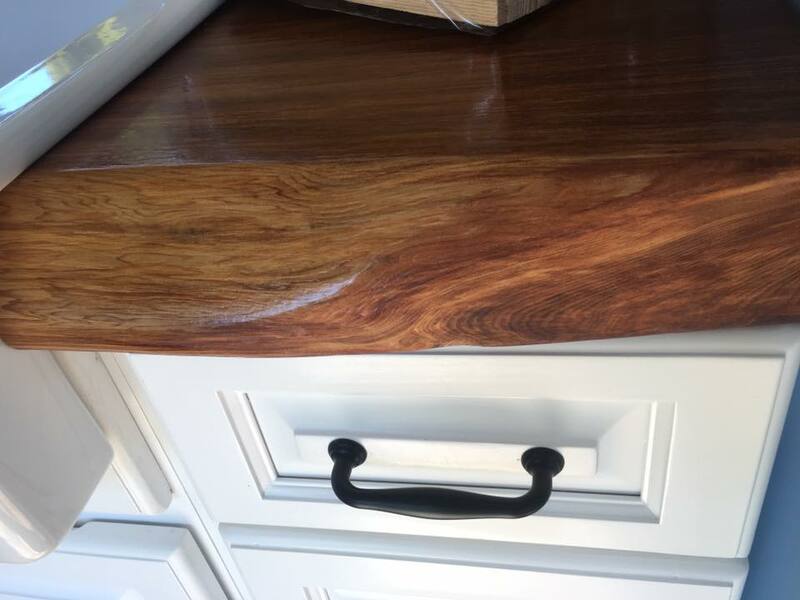 You can see the Live Edge on the custom Redwood counter tops that came out amazing! This added counter space was the best idea ever! Nice kitchen view, I love the window above the farm sink. As you can see here, the sink was installed fast for the photo-shoot, they will be re-installing the sink properly for the final product before delivery. Again, another view of the sink (installed improperly here but you get the gist)! You can really see the Custom Copper Faucet in this picture as well as the custom Redwood live edges on the counter tops! So beautifully done! There is a lazy-susan in that back corner cabinet, space under the sink for storage, and 3 drawers for extra storage next to the SMEG. 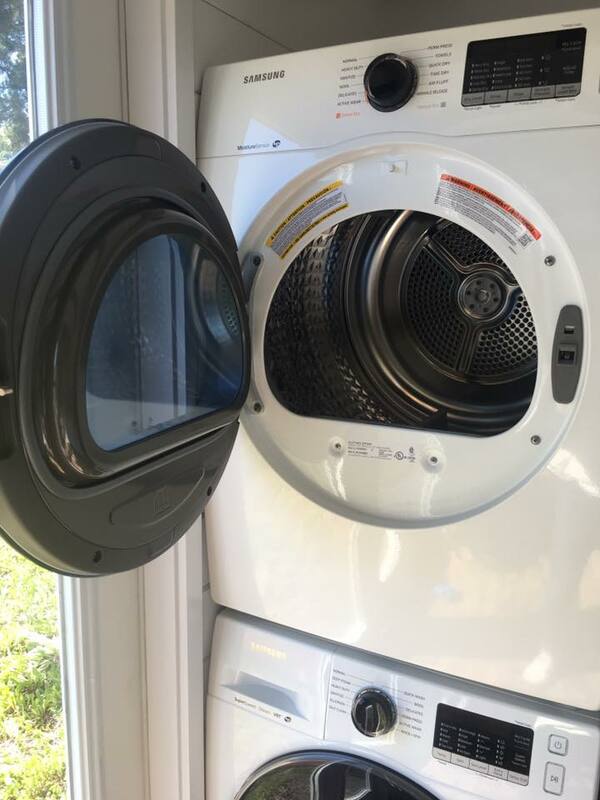 Don't forget, every home needs a Washer/Dryer <3 Large Kitchen View! So Ready to call this home! 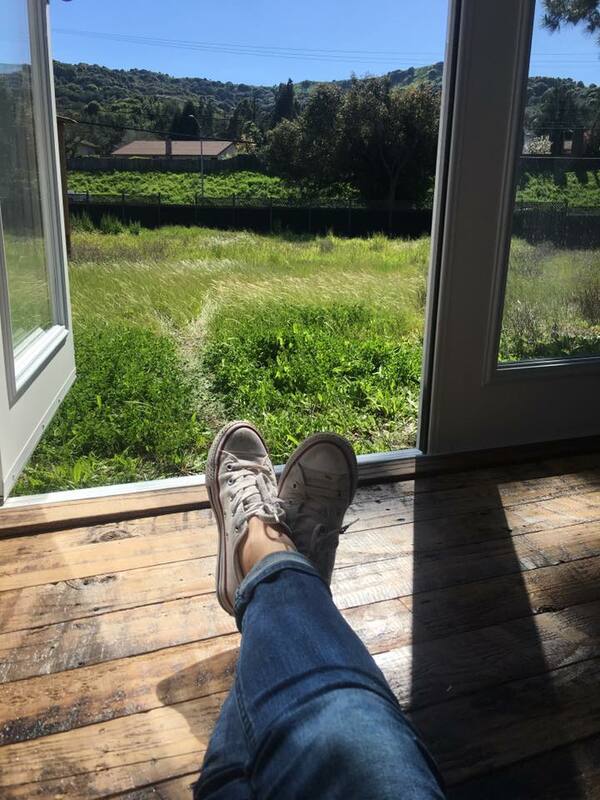 This home is literally a dream come true and almost 1 year in the making, I am so excited for this new space and this new life! I will update the blog soon when I move my own belongings into the home. Now its time to see if it all fits!?! I have already given over 30 bags of clothing to Good Will not to mention huge pieces of furniture donated and some going to old roommates as gifts! Thanks to everyone for their support during this transition period, as fun as it looks, its sometimes stressful and its going to be a HUGE lifestyle change. Special delivery from Vancouver! We had to move the house around a bunch of times to get the right fit but I am so happy with the results and the final location is perfect! Driving down the street and seeing your own house on the road is a crazy feeling! I have added a few pictures of the delivery. I've Finally GOT THE KEYS and am officially a Home Owner!!!!!!!!! Post-Delivery Pictures - these show some of the storage and small details that you don't get from the above images. I am so thrilled with the way the house turned out, it was a WORK IN PROGRESS to say the least and the builder's were so patient with me and all my crazy ideas! 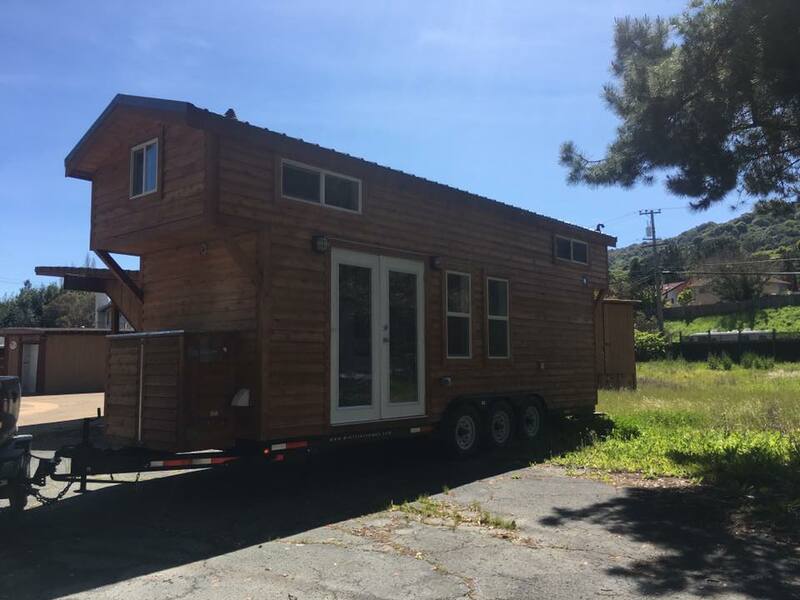 Huge Thanks to Brian at Tiny Homes Living! NOW I AM EXCITED TO MAKE THE HOUSE MY OWN!